Today I have made a tag/topper with items from a BOX I have at the side of me for waste and don’t know what to do with yet-pieces. I firstly got a chipboard tag and covered it with a dry wet wipe I had thrown in the bin then recovered it! Wet wipes are fabulous for backgrounds as they soak up all the mess and when dry you can decide if they are worth keeping for future projects. I moped up green sprays yesterday then when dry I added a honeycomb stamp with Tea Dye distress ink on the top. I then put some PVA glue on the chipboard and scrunched the wipe in places and added it to the top of the chipboard. 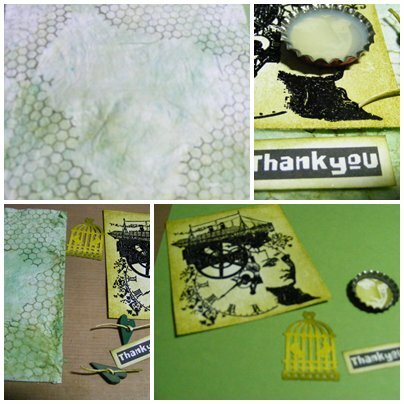 I then stamped a LaBlanche1320 steampunk image with Versamark and heat set with WOW ebony embossing powder.I then applied peeled paint, crushed olive and forest moss distress ink around the edges. 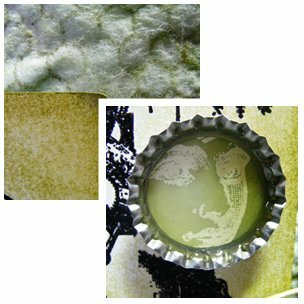 The bottle top is from a coke bottle and inside I have re stamped the La Blanch image with Versamark and heat set with WOW Bright White embossing powder and cut the face out with a circle punch and glued this to the inside after inking with peeled paint distress ink. On top of this is Glossy accents. Then I have placed the bottle top in the area of her face. The birdcage is a die cut and the hearts are wood taken from my BOX. The sentiment was made on my computer and printed out. ← Somewhere over the Rainbow…. That's a gorgeous idea and a fab project. Thanks for dreaming with us at Dragons Dream Tag It On. Los of interesting elements, Sue! Thanks for playing along with us in our Simon Says Wednesday Monochromatic challenge! Great Tag. Thanks for joining us at ABC Challenges. Lovely creation. Thanks for joining us at ABC Challenges.